We recommend Peter’s book to any student, adult learner, administrator, employer, or anyone looking to be inspired by and explore flexible higher ed options (and we’d say that even if our self-paced online college courses and our students hadn’t been featured for a in-depth chapter about StraighterLine). We’re excited that StraighterLine has been highlighted as part of the solution. Our students have over 60 low-cost online college courses to choose from and over 130 partner colleges that guarantee credit transfer. We are proud of the success of our students -- two, Sheila Jordan and Jason Ransom of which are featured in this new book -- and our self-paced online college course that works with traditional higher ed to increase student success and reduce student debt. In the excerpt below, Peter highlights his discussion with Jason Ransom, a successful StraighterLine student who used online courses to accelerate his business degree. I have four kids and they began to ask about college in an effort to start on a plan for their future. But I couldn’t help them in an authentic way because it was not a journey I had experienced. It really weighed heavily on me that I would not be able to be a role model for them when it came to earning a degree. It was a journey that I had not taken. I wanted to not just give them good advice but also be a key example for them. So I began looking at options. Going to a campus was out of the question, so online was the best for me. After doing research on available options, I learned about StraighterLine and registered. My first course for credit was medical terminology, and I passed it. Then I began to lay out a roadmap on this important project. I quickly fell in love with the structure and it really suited me personally. One of the many things that I love about StraighterLine is that it allows you to be bold in your aspirations and save time and money. The financial saving is a significant part, very doable, and the ability to compress time is spectacular. Even if you have the will, a traditional college won’t allow you to do either of those things. 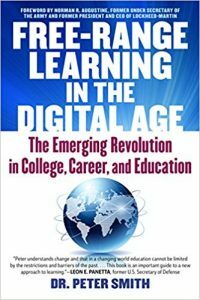 Excerpted from Free-Range Learning : The Emerging Revolution in College, Career, and Education by Dr. Peter Smith, in agreement with SelectBooks. Copyright © 2018 by Peter Plympton Smith.